Every year the Architectural League of New York recognizes eight dynamic young firms as Emerging Voices that have the potential to become leaders in the field. Historic winners like Morphosis (1983) and Toshiko Mori (1992) have become today’s lions, and practices like Johnston Marklee (2007) and Tatiana Bilbao (2010) have jumped to new heights after recent wins. This year’s crop was selected in a two-stage portfolio competition where a jury of architects selected the winners. The deciding jury included several previous winners like Dominic Leong (2017), Fernanda Canales (2018), and Marlon Blackwell (1998), giving the process a familial feel. Laureates for 2019 come from across North America and almost all are partnerships or collaboratives—capital letters feature prominently, too. Waechter Architecture will lecture at the Scholastic Auditorium at 130 Mercer Street, New York, New York, at 7:00 p.m. on March 14, as part of the Emerging Voices lecture series. For Ben Waechter, practicing architecture is an investigation into creating spaces with clarity. As founder of the Portland, Oregon–based firm, Waechter Architecture, he tries to design buildings that feature clear, visual identities that resonate with the people who experience them. The way the firm tackles this goal is through an informal, ongoing study Waechter calls “The Clarity Project.” He encourages his team to analyze their projects, and those of others, at every stage, from schematic design to post-construction. In doing this, they aim to discover the best ways to create a distinct internal logic for an individual design and reveal the underlying relationships that make it successful. “To us, a strong sense of clarity tends to be in places that simply feel the best to be in,” he said. According to Waechter, that’s one of the main themes that must be teased out when reviewing a project. Another theme is composition. The firm’s Tower House, built in 2014, presents a tubular facade with large-scale cutouts that organize the interior. It is situated on a steep site previously deemed “unbuildable,” so Waechter’s team envisioned the four-story home as a stacked structure. “We spend a lot of time making sure our projects are distilled down to a composition that’s whole and complete by itself,” he said. “If you take one point away or add something, it doesn’t work anymore.” Equally important is creating clarity of figure-ground. Waechter determines the programming within a building from the beginning. “We like to think of our plans as being carved out of a building mass and then using poches as secondary support spaces.” This strict editing process, as well as the firm’s clear commitment to minimalism, is inspired by Swiss architecture and Waechter’s own architectural journey. As a former employee of Renzo Piano, he takes the refined details seriously. “There’s a constructional logic to Renzo Piano’s buildings,” he said. “One similar thread between our work is that we also try to include a few details done really well in order to create a stronger identity.” In some cases, Waechter distinguishes his architecture by simply framing views of the surrounding locale. For a recently completed project at Furioso Vineyards in Dundee, Oregon, the firm designed a glass-enclosed tasting room on a raised platform. 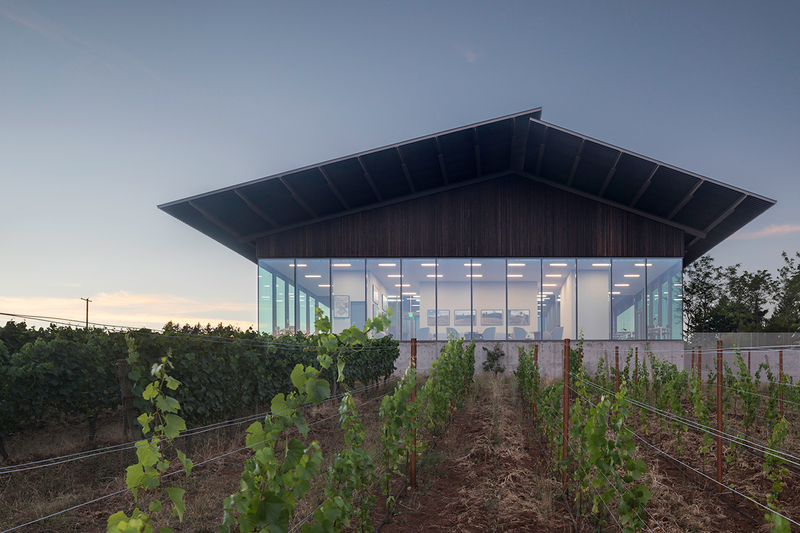 The height allows guests to feel as if they’re hovering above the vineyard while simultaneously connecting them with the wine-making process. If one thing is clear, it’s that clients are attracted to Waechter Architecture’s meticulous attention to detail and old-school analytical practices. Though its award-winning portfolio largely showcases expertise in single-family home design, with the vineyard project and their upcoming Society Hotel in Bingen, Washington, they’re branching out to into new territory. LEVER Architecture is currently renovating the Oregon headquarters of The Nature Conservancy in East Portland. 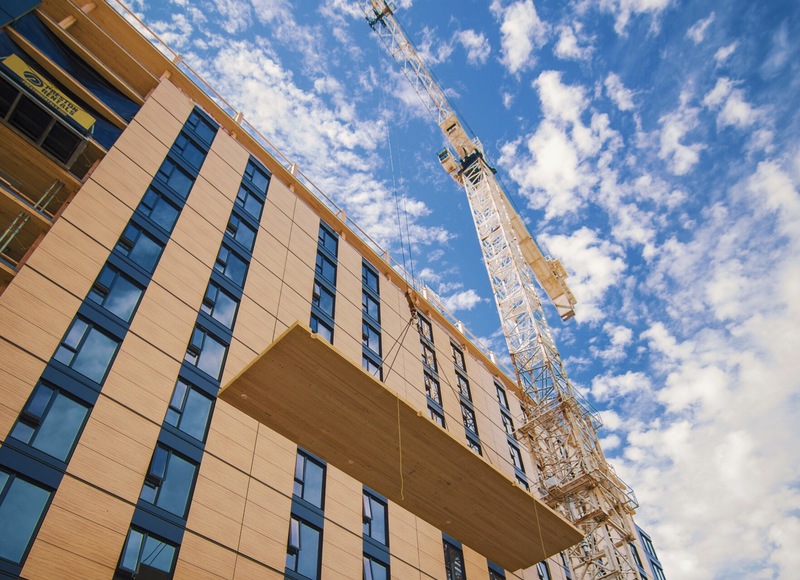 The Oregon Conservancy Center (OCC), as the building will be known, is on track to becoming one of the first structures in the country to utilize U.S.-manufactured cross-laminated timber (CLT) made from Forest Stewardship Council (FSC)–certified wood. Located at the corner of SE Belmont Street and SE 14th Avenue, the three-story structure will be revamped with an open-office space for the majority of its staff. LEVER will elevate the existing facade with a weathered steel rain-screen and high-performance glazing while building a one-story addition featuring mass timber. The newly built structure will house event space and a conference center, topped with a roof garden and an outdoor deck. The architects specified sustainably-sourced Oregon Juniper, CLT, and cedar from Oregon, Washington, and California in an effort to complement the Conservancy's commitment to energy efficiency and environmental stewardship. An array of photovoltaic panels will hover over the building and cover one-quarter of its energy use while a new variable refrigerant flow (VRF) system will assist in heat recovery. “We’re excited to be part of a project that embodies The Nature Conservancy’s commitment to protecting and restoring critical ecosystems,” said LEVER’s principal Thomas F. Robinson in a statement. 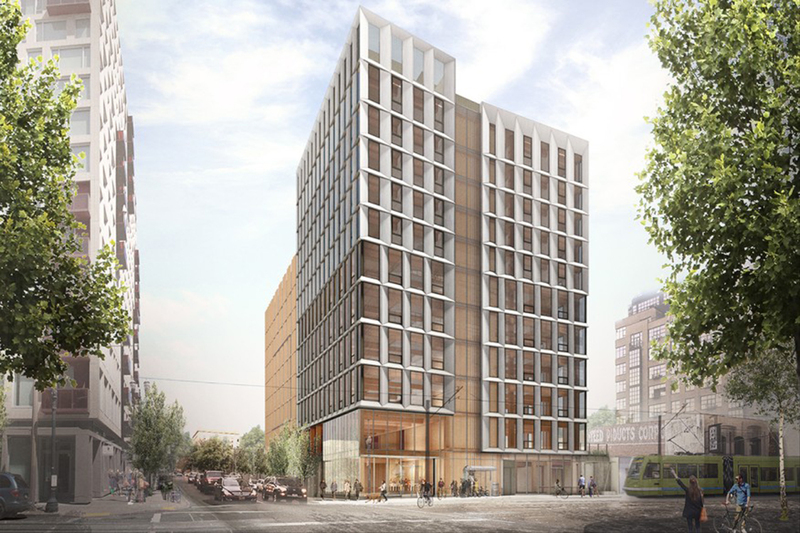 “The design connects people and nature by integrating materials and landscapes that are specific to The Nature Conservancy’s priority projects around the state.” LEVER is working alongside Portland real estate developer Project^ to get the building off the ground. Project^’s vast portfolio includes the award-winning Framework, the first wood high-rise permitted in the country. Construction on the OCC started in March and is expected to be done in early 2019. The building is set to receive LEED V4 Gold certification. Construction has begun on a contentious weatherproofing, renovation, and seismic retrofit plan led by architects DLR Group for the Michael Graves–designed Portland Building in Oregon. The $195-million plan started with the simple aim of halting persistent water infiltration issues. However, as the scale of that investment became clear, Portland authorities found that it made more sense to completely overhaul the tower so that it might be fully retrofitted for improved and adaptable long-term use. The project now aims to extend the life of Graves’s iconic work by 50 to 100 years, an effort that involves the controversial act of reskinning the 360,000-square-foot tower with a unitized aluminum rainscreen and adding a reinforced concrete shear wall through the building’s core. This wall will be supplemented with steel reinforcing to bolster the tower’s seismic resiliency, among other features. Built on a minuscule budget in 1982, Graves’s bold, competition-winning concept was value engineered into submission as it was erected. Cost-cutting efforts included the use of an exterior concrete structural system, an emphasis on humble materials, and the application of shallow-relief ornamentation, among other approaches. Shoddy detailing from the concrete wall system created the water infiltration issues, while also forcing Graves—who initially wanted to hang colorful stucco panels off the exterior walls in order to express the building’s iconic, historically evocative design—to instead opt for painting the bare concrete walls in colorful hues. The designers plan to encase the 15-story tower in a new insulated and waterproof wrapper while also maintaining—and in some cases, implementing for the first time—Graves’s original intentions for the building’s facade. The building’s dark, square-shaped windows, for example, were installed for energy conservation reasons against Graves’s wishes and will be replaced with insulated clear glass openings. Other changes include updating the tile patterns at the building’s base to a larger, 2-foot-by-2-foot grid, closer to what was originally proposed. The plan also includes closing in and reconfiguring some of the unsuccessful ground floor retail spaces and an old subterranean parking structure. The changes have been controversial within the preservation community, and local authorities have acknowledged the seemingly radical nature of the plan, but the restorative scheme is deemed necessary to fully extend the life of the structure and improve its functions as a public office building. Initial partial demolition of the facade elements began in March of this year and construction has now entered full swing as ground floor areas are closed off and the windows are removed. The project team expects to complete the renovations by 2020. Celebrate international, impactful design as you take in the summer sun, enjoy great local eats, and take a tour of the Street Seats exhibition! The Street Seats Grand Opening is the culmination of ideation, creative problem-solving, and teamwork from designers around the globe. Street Seats is an outdoor public exhibition that celebrates local and international design, urban innovation, and sustainability. Designers from 6 continents, 24 countries, and 22 U.S. states responded to an open call for entries to Reimagine the Public Bench. 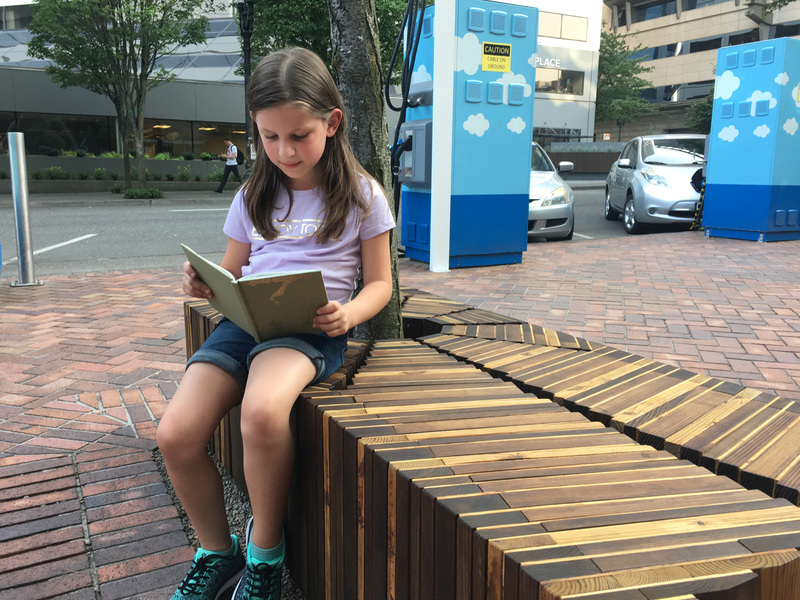 These fifteen chosen Street Seatsare environmental and unique, embracing and enhancing the vibrancy of downtown Portland. Each bench was imagined, designed, and built by creatives from around the world. Join us for the Grand Opening, August 9th from 5-7pm as we launch this 6-month outdoor design exhibition and announce the top 3 Finalists, each receiving cash prizes. In the Beginning: Minor White’s Oregon Photographs Portland Art Museum 1219 SW Park Avenue, Portland, Oregon On view through October 21 The Portland Art Museum (PAM) is currently presenting In the Beginning: Minor White’s Oregon Photographs, a two-part photography exhibition highlighting the evocative works of the famed 20th-century modernist photographer. 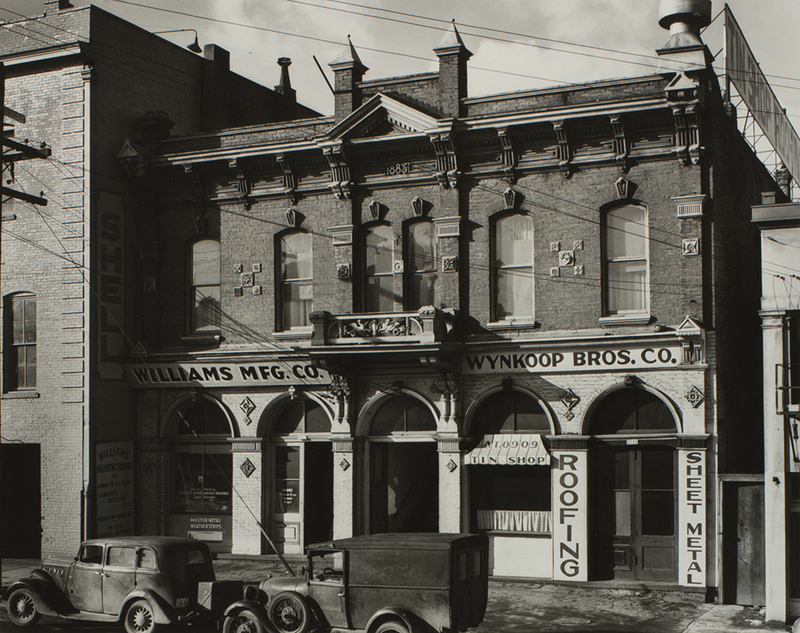 The twin showcases focus on White’s early work documenting historic architecture and landscapes in Oregon. In 1938, White was hired to record changes along the city’s Front Avenue for the Oregon Art Project, part of the Works Progress Administration (WPA). Employed as a “creative photographer,” White documented the iron-front and industrial buildings in the district that were to be demolished in order to make way for Harbor Drive, a new highway on-ramp. The project was followed in 1942 by a commission from PAM to document a pair of historic Portland homes. Pratt Institute has selected Allied Works to complete a new building to house its Master of Fine Arts and Photography programs on their 25-acre Brooklyn campus, providing the School of Art “a distinct...identity on campus for the first time.” The project will feature flexible classroom, studio, and tech lab space, as well as room for public galleries. 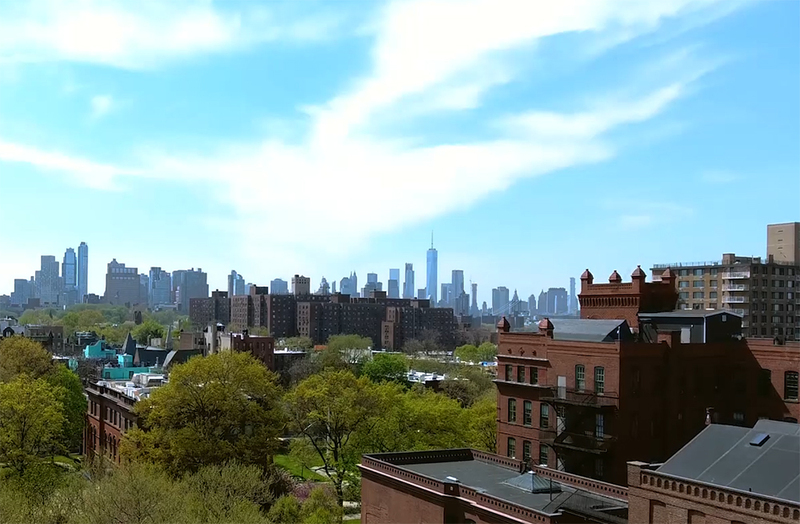 The new School of Art is designed to be a “cultural anchor” for Brooklyn and for the broader New York art world. The project intends to “catalyze both the campus and community, [and become] a wellspring of art and creative energy,” according to Allied Works founding partner Brad Cloepfil. Allied Works, which was founded in 1994 and has offices in Portland, Oregon and New York City, has completed a number of other cultural and educational commissions, including the National Music Centre of Canada in Calgary and a creative arts center for Portland’s Catlin Gabel School. While they have completed an array of projects in New York, including the 2008 transformation of the Museum of Arts and Design, this will be the firm’s first foray into Brooklyn. An eye-catching proposal for a pair of interlinked skyscrapers that would have reshaped Portland’s skyline won’t be realized after all. 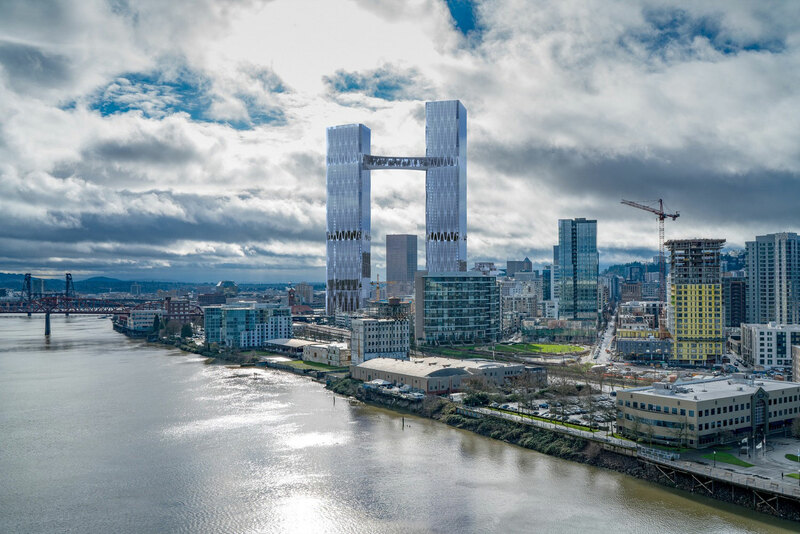 While renderings of the twin towers from William Kaven Architecture (WKA) captured the internet’s attention when they were released earlier last month, economic redevelopment agency Prosper Portland’s three chosen finalists for the downtown post office site leaves the towers off their list. Prosper Portland was seeking to fill a 32-acre hole in the fabric of Portland’s Pearl District, as well as redevelop the 14-acre Postal Service headquarters site within, which will soon sit empty. In the agency’s RFQ, the project is pitched as the “Broadway Corridor” which would link Chinatown to the Pearl District, and the winning developer would be given the right to purchase the land before enacting any redevelopment. Although Prosper Portland had only asked interested firms to submit their qualifications, not full proposals, Portland-based WKA responded with plans for two towers, one of which topped out at 970 feet, linked with high-flying skybridge. The plan was pitched as a potential tourist attraction, and in an Op-Ed for DJC Oregon, WKA principal Daniel Kaven defended the grandiose scheme as necessary for pushing Portland into the 21st century. “The city of Portland, currently, is devoid of iconic buildings – at least any that a tourist or foreign architect might recognize,” argued Kaven. “It is easily established that great buildings drive tourism and generate money. Every year millions of people make trips to destination cities just to see towers, memorials, skyscrapers and art institutes.” Instead, Prosper Portland, who purchased the site for $88 million with the intention of turning it into a mixed-use hub, has chosen Denver-based developer McWhinney, the San Francisco-based office of Related Companies, and Denver developer Continuum Partners. WKA’s proposal would have brought 5 million square feet of developable space to the site and included condos, apartments, hotel rooms, offices and retail space, though whatever eventually lands there will likely be more subdued. It’s expected that the final plan will include around 500 units of city-owned public housing and 2,000 private units, with 10 percent set aside for low-income residents. The next step for the three finalists will be a presentation to the public on their plans on March 21 at 5:00 PM, at Leftbank Annex, 101 N. Weidler St. in Portland. A newly-formed activist group has its sights set on bringing high-speed rail to the Pacific Northwest region. 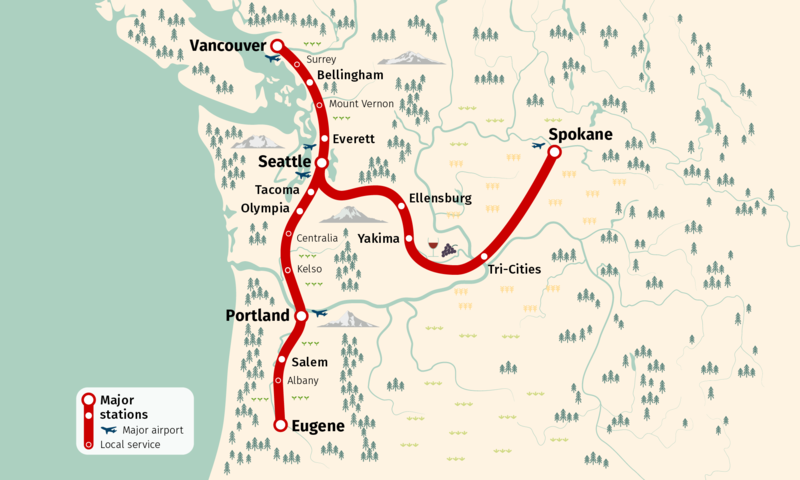 Cascadia Rail and its members envision a new high-speed train network connecting Portland, Oregon, Seattle, Washington, and Vancouver, Canada with an eastern offshoot between Seattle and Spokane, Washington. The group, emboldened by the recent success of the Seattle Subway coalition and its transformative Sound Transit 3 metro expansion in 2016, is banking that growing regional awareness around the interconnectedness of transit, climate, and social justice issues will coalesce in their favor. The group launched the initiative via Seattle Transit Blog in a post earlier this month with the slogan “You deserve faster.” Backers of the group argue that access to high-speed transit could help alleviate regional inequality, economically link a string of vibrant international cities together, and boost regional tourism. The initiative has been under study by the Washington State Department of Transportation since 2017. The department submitted a report late last year to the Washington State legislature recommending more study on the issue and urging state, federal, and Canadian agencies to move toward facilitating a plan. The department compared traditional steel wheel and Maglev trains as well as Hyperloop systems for the study. Preliminary estimates in the report put the cost of the new high-speed system at between $24 billion and $43 billion, depending on routes and train technologies chosen. The Washington State Legislature is currently considering a two-year transportation funding bill that could include up $3.6 million earmarked for detailed study following up on the 2017 report. If funding for the additional study is approved, analysis could be completed as soon as mid-2019. A timeline for design and construction of the train network has not been put forth. Portland, Oregon–based William Kaven Architecture (WKA) has revealed the full vision behind the firm’s eye-catching proposal to add a pair of interlinked high rise towers to downtown Portland’s 32-acre mixed-use Broadway Corridor site. The updated plan comes in response to an RFQ put forth by economic redevelopment agency Prosper Portland meant to generate ideas for how to best reconnect the city’s Chinatown and Pearl District neighborhoods. WKA revealed the tower component of the proposal late last year. Prosper Portland’s vision calls for demolishing an existing central postal facility and removing an on ramp to the NW Broadway bridge in order to spur more transit-oriented development, reorient the neighborhood around an expanded central greenway, and promote equity and sustainability goals within the heart of the city. Under WKA’s vision, the site, currently co-owned by the Postal Service and the Portland Housing Bureau, would give way to a nearly five-million-square-foot redevelopment scheme that includes not just the pair of high-rise towers, but also calls for a new covered market hall, a new museum, a public reflection pool, and several low- and mid-rise housing towers. Describing the project, WKA partner and founder Daniel Kaven said, “This is a historic opportunity to revitalize a core area of our city. Our vision is to develop an urban district capable of accommodating Portland’s rapid growth and provide the building blocks of future transportation resources. It is our hope to work with the City of Portland and its stakeholders to fully realize a vision that will both be an architectural draw to Portland and spur economic and cultural development far beyond the scope of the project.” If built according to plan, the scheme’s twin tower component would reshape the Portland skyline. The interlocking towers differ in their heights, with the tallest of the two slated to rise 970 feet. The rectilinear and diagrid-wrapped towers would be connected 680 feet up by a truss-supported bridge containing an indoor botanical garden, among other programs. If completed as planned, the towers would be the tallest in the city and among the tallest on the West Coast. New renderings released for the proposal show a neat grid of mid-rise structures surrounding the expaanded greenway, with a site plan indicating that the new developments will be connected by a new underground transit station. The transit station is delineated along streetlevel by a large butterfly roof structure capped with moss. It is expected that a full build-out of the project would include additional design teams. 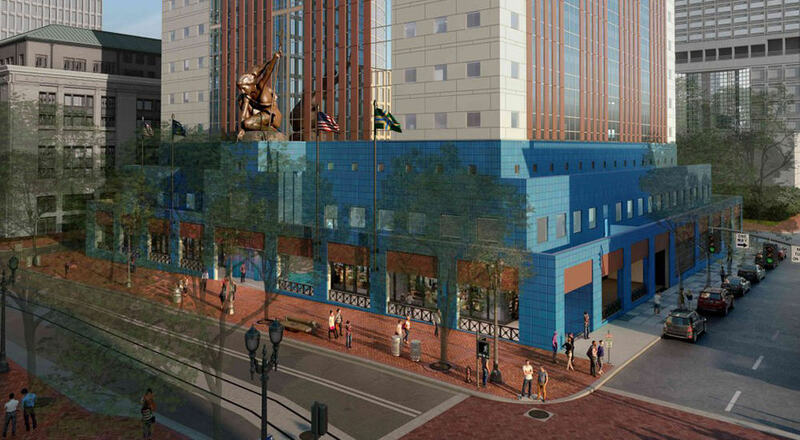 Prosper Portland is expected to reveal a shortlist with project finalists in March of this year. A timeline for full implementation of the project has not been released.